(Nanowerk News) Imagine a box you plug into the wall that cleans your toxic air and pays you cash. 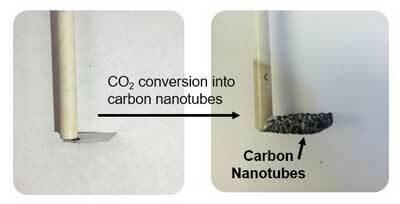 In a report published in ACS Applied Materials and Interfaces ("Toward Small-Diameter Carbon Nanotubes Synthesized from Captured Carbon Dioxide: Critical Role of Catalyst Coarsening"), Pint, interdisciplinary material science Ph.D. student Anna Douglas and their team describe how tiny nanoparticles 10,000 times smaller than a human hair can be produced from coatings on stainless steel surfaces. The key was making them small enough to be valuable.